Bread is quickly becoming a new favorite item to bake, especially when I keep getting turned on to these very simple recipes. Now there is no need to make a trip to the store for bread; I can have a loaf put together, baked and in my mouth in about 1 to 2 hours! 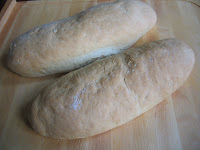 Nearly every recipe on my blog is something I've created, but this bread recipe and the English Muffin Bread both came from my friend Carolyn. - Thanks for helping me be fat and happy C! Knead 2-4 minutes, then let rest for about 5minutes. Divide in two parts. Roll each into a rectangle 12 " long x 8" wide. 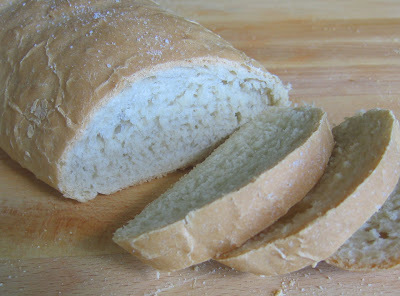 Roll up, pinch seam on bottom of loaf. Grease baking sheet, sprinkle with cornmeal. Place loaves on sheet and let rise for an hour. Bake until lightly browned. You can brush with a beaten egg white for gloss and shine.